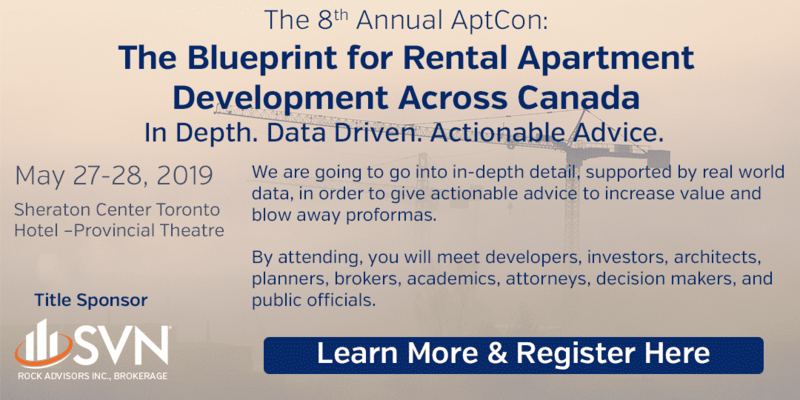 The AptCon conference, to be held on May 27-28, 2019, is a gathering place for developers of high-rise condominiums and rental apartments. Attendees with mingle with movers and shakers in the industry and will learn about the new and growing opportunities of rental apartments. Here, condominium developers can learn more about how to build, lease-up, operate or sell purpose-built rental apartments, and the advantages the form has over traditional condominium development. The eighth annual conference will feature many speakers, including experts in how to develop a multifamily rental community, architects, experts in the unique aspects of marketing rental apartments. Attendees will learn about how to finance their developments, and how to ensure a quick lease-up. While Toronto’s development industry is as hot as ever, for the past few years most of that development has been in high-rise condominiums, so much so that some experts worry the condominium market is over-saturating. However, demand for rental apartments has risen rapidly. “Unfortunately, developers don’t like to change what’s worked for them in the past,” Lobo goes on. “And developing an apartment has a different set of challenges compared to developing a condominium. There are different opportunities as well. A condominium is a one-time sale, a quick buck. An apartment is an investment opportunity, offering a long-term steady income. This conference will educate many on the need to alter their approach, and the benefits that will come to them if they do. Toronto’s eighth annual AptCon conference on May 27-28, 2019 is being hosted by SVN Rock Advisors Inc., Brokerage. It will take place in the Provincial Ballroom of the Sheraton Hotel in downtown Toronto . There will be a deal room where potential apartment developers can sit down one-on-one with members of the SVN Rock team to discuss possible projects in depth.